The Musée des Arts Décoratifs in Paris welcomes the 2014 edition of the AD Intérieurs exhibition until November 23, 2014. Fendi Casa has teamed up with architect François-Joseph Graf for the occasion. 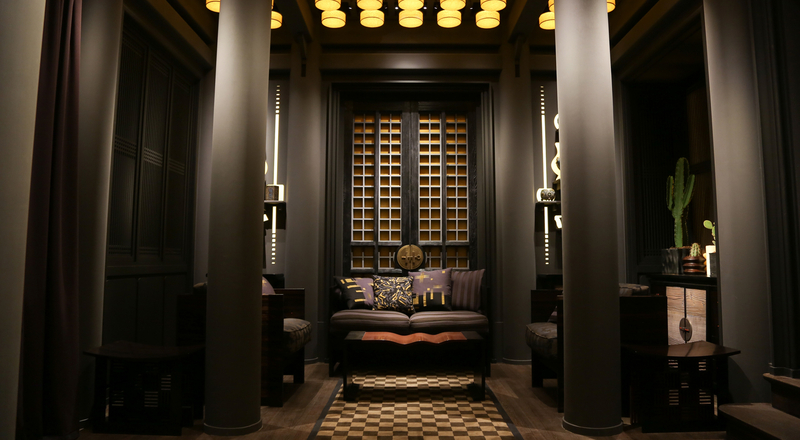 To present a capsule collection of furniture that blends Oriental influence with Roman tradition, François-Joseph Graf and Fendi Casa created a pavilion with Chinese inspiration. Set in the heart of vases from the Yuan, Ming and Qing dynasties – shown in public for the first time – the space elegantly displays cabinets, sofas, lights and coffee tables decorated with the mythic Fendi logo. All the pieces are sculpted from exotic woods, an homage to the noble materials and luxuriant ornamentation of Chinese cabinet making. Fendi Casa has shown its creations at the Design Miami fair since 2008 and since 2009 at the Salone Del Mobile in Milan. This latest exhibition marks another exciting furniture innovation from Fendi Casa, which has previously created exclusive collections with renowned designers including Thierry Lemaire, Maria Pergay, Peter Marigold and Tom Dixon.